"My family! They're out there!" 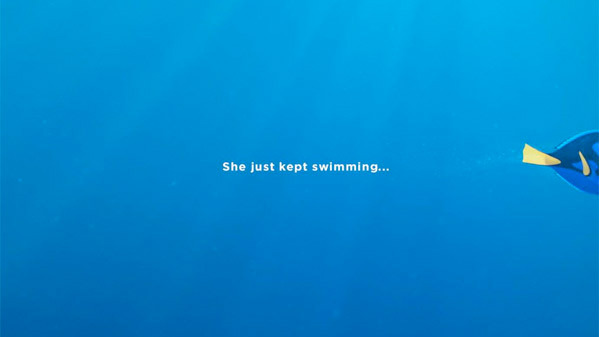 Disney-Pixar has debuted the first charming trailer for the long-awaited sequel to 2003's Finding Nemo, titled Finding Dory. Marlin and Nemo and their new friend Dory are still friends, but this time it's Dory who ends up lost, as she just kept (sleep) swimming in an attempt to find her family and now they can't find her. I love the original Finding Nemo and this already looks like an amusing follow-up that isn't pushing the story too far from the characters we love. The voice cast includes Ellen DeGeneres, Albert Brooks, Idris Elba, Dominic West, Diane Keaton, Ty Burrell and others. I'm sure there are more characters we'll meet down the line, including Dory's parents. Jump back in the water below. We already know that the story was going to follow Dory (Ellen DeGeneres) and Marlin (Albert Brooks) on a journey to find the former forgetful fish's family. Eugene Levy and Diane Keaton have already been named as Dory's parents Charlie and Jenny, and there's also a beluga whale voiced by Ty Burrell. And Pixar president Jim Morris also revealed to Omelete that a big part of the film will take place at the Marine Biology Institute of California, a huge rehabilitation complex for marine and aquarium life. Dory discovers that she was born and raised there, only to be released into the ocean when she was young. Finding Dory is being directed by Pixar veteran Andrew Stanton (Finding Nemo, Wall-E, John Carter), and co-directed by Angus MacLane. Disney-Pixar has Finding Dory set to open in theaters June 7th, 2016 next summer. I know it's only the first trailer and of course I'm excited but the trailer really didn't show much. I thought maybe it was a Teaser but in fact it's Trailer #1. Still amped though! I'd file this one under "teaser" for sure. This will finance the next two original feature-length films (this is a lie). Looks good. I'm worried they have disregarded her character arc in Nemo for easier plot. Interesting they taking this story to such an area. It feels a little slighted to have Dory remember her "lost family". It makes sense, but the implications are kind of serious. // Good thing this is a kid's movie and it should not be taken seriously. Dory is a super annoying character. I'd just be like "and that was the last time we saw Dory..."
Looks charming. However, I hope the plot is pushed forward by more than just memories popping up at the screenwriter's convenience.